Phytosanitary products are used for crop protection (weed killers, fungicides, insecticides, growth regulators). They are subject to market approval. The packaging collected includes plastic cartons, plastic or metal drums with a volume of between 25 and 300 litres, cardboard boxes and paper bags. 66% of collected packaging can be recycled under strict controlled conditions and for determined use. Fertilizer products are used for maintaining vegetal nutrition or for improving the physical, chemical and biological properties of the soil. The collected packaging is '1 point' Big Bags and plastic bags. These are also known as Flexible Intermediate Bulk Containers (FIBCs). The Big Bag waste management scheme was put in place in October 2007, under the initiative of the Fertilizer Industry Association (UNIFA) and the French Commercialisation of Fertilizers Association (AFCOME). 96 fertilizer and soil enhancer manufacturers work in conjunction with ADIVALOR. These are certified seeds, produced and commercialized according to very precise product specifications. 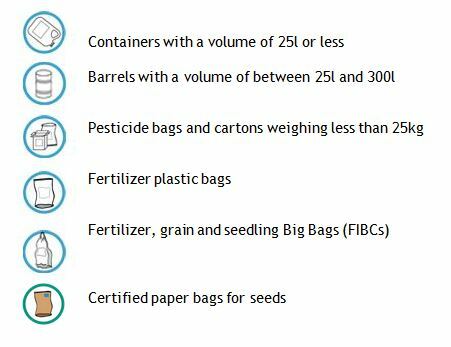 The collected packaging is "4 point" Big Bags (FIBCs). On 27th February 2009, ADIVALOR and the Association for the Recovery and Recycling of Seed Packaging (ARES) signed an agreement to begin the handling of potato seedling and seed Big Bags. These are cleaning products and disinfectants associated with milking equipment and hygiene products. These are mainly 10, 20 or 60 litre drums of high density polyethylene of various colours. The average rate of collection for empty hygiene products is rapidly increasing in France. So far 725 tonnes of empty containers have been collected and sorted to be reused. Since 1st January 2010, under the initiative of the French Detergent, Service and Industrial Hygiene Association (AFISE), dairy farm hygiene product manufacturers have committed themselves to financing the management of waste packaging arising from their products.